KOYO are playing a special Download Festival warm up gig at the White Hart in Corby on June 7. The band have been busy touring across the UK since the release of their self titled debut album last year. 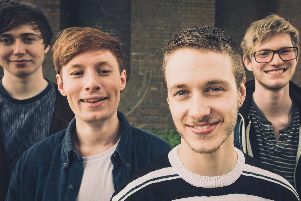 Formed in Leeds in 2015, KOYO comprise singer and guitarist Huw Edwards, guitarist Seb Knee-Wright, bassist Dan Comlay, drummer Tom Higham and Jacob Price on sampling and synthesizers. They blend influences as wide as Ozric Tentacles and The Velvet Underground, My Bloody Valentine and Kurt Vile. KOYO will be playing Download on Sunday, June 10, on The Dogtooth Stage. Support at Corby will be by Veins and Family Of Noise. Tickets cost £3 in advance before fees and are available via WeGotTickets. KOYO will return to the region in September for Rocked Up’s Hootenanny.